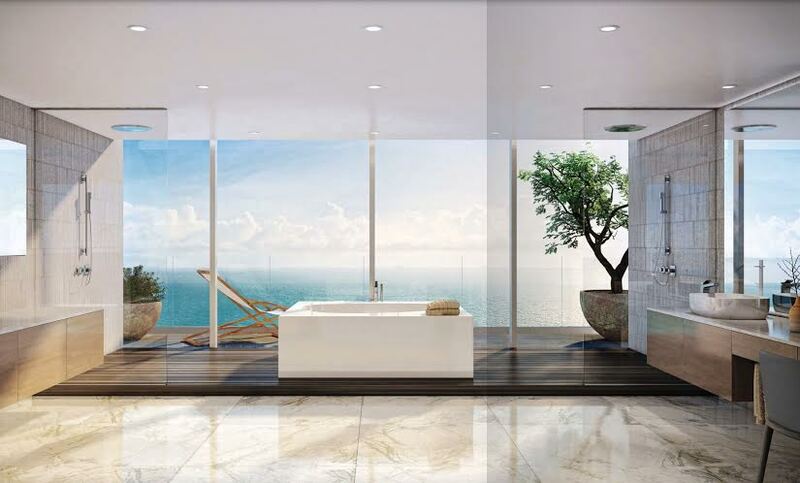 The Oceana Bal Harbour combines nature and luxury into an incomparable living space. Nestled between the bay and the ocean, this 5 ½ acre lot draws inspiration from its natural surroundings. The building is separated on lower levels so residents can have a constant view of both the bay and the ocean. Lush greenery and stainless steel sculptures provide inspiring backdrops for the two tennis courts, lap pool, beachfront infinity edge pool and putting green. Residences at Oceana Bal Harbour enjoy amenities such as a residents-only restaurant, a state of the art fitness center, valet services, and 24/7 multi-level security. Individual condos start at $2 million and have 1-4 bedrooms. 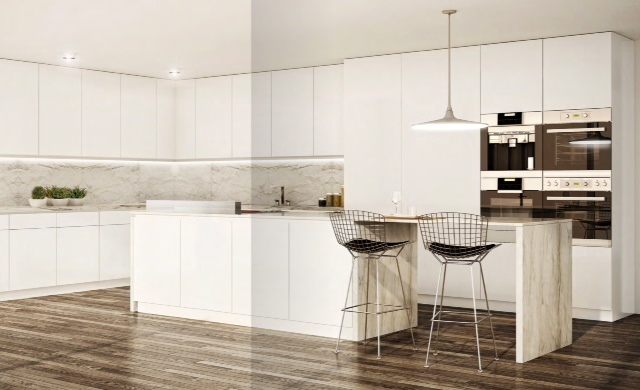 The condos’ interiors are designed by world-renowned Piero Lissoni and feature premier high-tech appliances. The building houses 239 condos with oceanfront views on 28 floors. The first floor is the lobby and restaurant area. Floors 2 through 26 hold a mix of 1-bedroom condos from 1,323 to 1,580 square feet, 2-bedroom condos from 1,800 to 2,600 square feet, and 3-bedroom condos from 3,400 to 4,200 square feet. One- and two-bedroom floorplans have either bay or ocean views, while three-bedroom condos have a “flow-thru” floorplan that gives occupants a spectacular view of both.The condos on the 26th floor are 4-bedroom floorplans ranging from 5,900 to 7,700 square feet, and the 27th floor contains 4-bedroom duplex condos with access to a private rooftop deck with a private pool and summer kitchen. Not only are the interior units spacious, but each has a large private balcony. 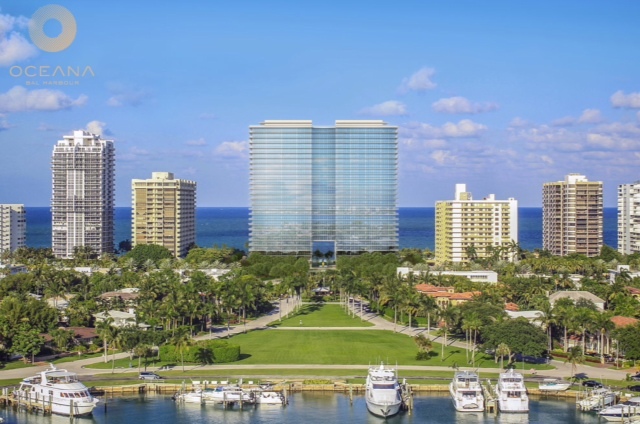 Just 15 miles from downtown Miami, Bal Harbour residents can reap the benefits of both the fast-paced city life and the calm relaxation of luxurious living. The area boasts a population made up of people anywhere from 25 to 85 years old, with families and singles living all along the shoreline. Located walking distance from the Shops at Bal Harbour, Oceana residents have a myriad of choices for shopping, dining and entertainment. The shops include high-end retailers like Dior, Saks Fifth Avenue, Oscar De La Renta, Jimmy Choo, Cartier and Tiffany. When shoppers need to relax over a meal, they can choose from one of the many renowned restaurants peppered throughout Bal Harbour. With only around 2,500 people, Bal Harbour is a break from the crowds of Miami. However, the thriving downtown Miami district is easily accessible. Residents at Oceana Bal Harbour are just a short distance away from Miami’s Design District, Aventura Mall and Sunny Isles, museums, theaters, fine dining, nightclubs and world-famous beaches. They can enjoy concerts or football games at the Land Shark Stadium or take the family to the Metrozoo or Seaquarium. Miami-Dade is known for its eclectic population, providing something for any interest. But after the day is done, occupants of Oceana Bal Harbour can get away from the noise and throngs of people that come along with such a thriving city. They can relax in one of Oceana’s jacuzzi’s or sit on their balconies while watching the waves roll by. Maintenance: .90 per sq. ft.